The holiday house/villa for rent lies under the walls of the ancient, fortified monastery which crowns this Mediterranean island. The location is convenient for the Monastery of Saint-John the Theologian, Patmos' main attraction, and for admiring and photographing the whitewashed stone architecture of the unspoilt Chora (the name of the greatest or more important town or village of a Greek island). The Chora, the monastery, and the Cave of the Apocalypse are listed as a UNESCO World Heritage site. This romantic hideaway commands wonderful views of the sea looking south and west. The area is very quiet as the narrow lanes are impassable to traffic, and there are no bars or restaurants within hearing distance. 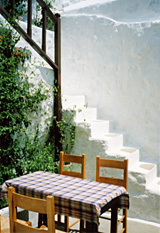 The rental house's central location on the island makes it an ideal jumping-off place for walking the cross-country paths that criss-cross Patmos. Stone built, modernised, traditional house with two courtyards filled with flowers, and a roof terrace facing south and west to the sunset. Sleeps 4. Ground floor: entrance courtyard; sitting / dining room with raised kitchen at one end, giving onto a shaded patio planted with bougainvillea and plumbago; twin bedded bedroom; bathroom with shower. First floor: master bedroom / sitting room with double fourposter bed and ensuite bathroom with shower. Roof terrace with ample seating and unrestricted views to the countryside and sea. The house has a fully equipped kitchen with large refrigerator, electric cooker with oven, coffee-maker, all utensils, tableware and basic supplies. Sheets and towels are provided, but guests will need to bring their own beach towels. The housekeeper keeps the house clean and tidy and waters the flowers. Further domestic help may be arranged for clothes washing, shopping and cooking, at an additional charge. A welcome pack is provided consisting of bottled water, coffee, tea, milk, biscotti and jam. Food / household shops are a few minutes away from the house, and there are restaurants within easy reach in Chora. You can take a bus or a taxi to Patmos' main town and harbour, Skala. Find out more about this Greek island, and things to do. When you arrive on the island, you can be met if required. Find out more about travel to the Dodecanese island of Patmos. Find out rental prices for the house, availability and booking.